Sin Slayers is an RPG with roguelike elements set in a dark fantasy world, where your choices determine how challenging the fights and enemies will be. You have arrived in an unfamiliar place, where demons are kings. Find a way to get out of here or wander these lands endlessly. Mostly Positive (111) - 79% of the 111 user reviews for this game are positive. «There is nothing worse, than a man without joy». Today we’ll talk about our second location, the Graveyard of Despondency. Sin Lord of Sloth governs this place along with his minion — Ghost Reaper. You’ll feel apathy, fear and sadness of the cemetery right away. Crypts, graves, bones and thick fog are everywhere, only the most courageous heroes will have what it takes to pass. Everything here is filled with evil and hopelessness, even the fountain will increase your sinfulness by 12 points every time you visit it. You’ll have a difficult choice to make: attack the enemy with your current health or to restore it, strengthening the enemy. Ghost is a common graveyard visitor. It’ll attack anyone who’ll get too close to it. It can not only slash with his dagger, but also curse its enemy, draining his life energy. It’s weak to holy and electric attacks. Graves, crypts, bones and monsters behind every corner will drive anyone insane. Gravedigger was no different, now he’s under a full control of Sloth. He’ll attack anyone who dares to visit his lands. Watch out for his shovel! Alive he was a noble protector of his kingdom and achieved many great feats, but then he betrayed his king. Because of that he now must wander endlessly in the World between worlds. He’s afraid of fire, use it against him. Not all ghosts are the same, some materialized almost fully thanks to their achievements in life. They are called Fantoms, not dead, but not alive as well. In a battle with these skilled warriors any turn can become your last. Probably the most interesting evil minion of the Graveyard. It doesn’t like to fight, but more than happy to summon other to its aid. Holy attack have no effect on him. Frost and poison damage won’t be of a great help as well. The first serious obstacle on your way to the second seal. He protects the resting places of souls and able to summon ghosts on the battlefield. Beware of the scythe, the power of death itself is imbued in it. The second Sin Lord does not leave his throne, but don’t expect an easy battle. Indifferent to everything, he gets mad if someone dares to interrupt his solitude. Sloth is strong and will easily dodge a critical attack, but due to Sin it is very slow. Cocky travellers will surely die in a fight with him. Relax by the fountain before the fight and recuperate or not… it’s for you to decide. Slowly but steadily, we’re getting closer to the halfway mark of the Kickstarter campaign in general, and its goal in particular. Today, thanks to your support, we’ve reached 36% of our goal and enlisted 263 official sin slayers to our ranks. There are 17 more days in the campaign, and endless battles with demons in the near future! Let’s gather our strength, raise the Sin Slayers banners, and tell everyone in our favorite social media networks that Sin is coming! The chosen heroic souls will gather in the world between worlds and together we will lift the Valley’s curse. 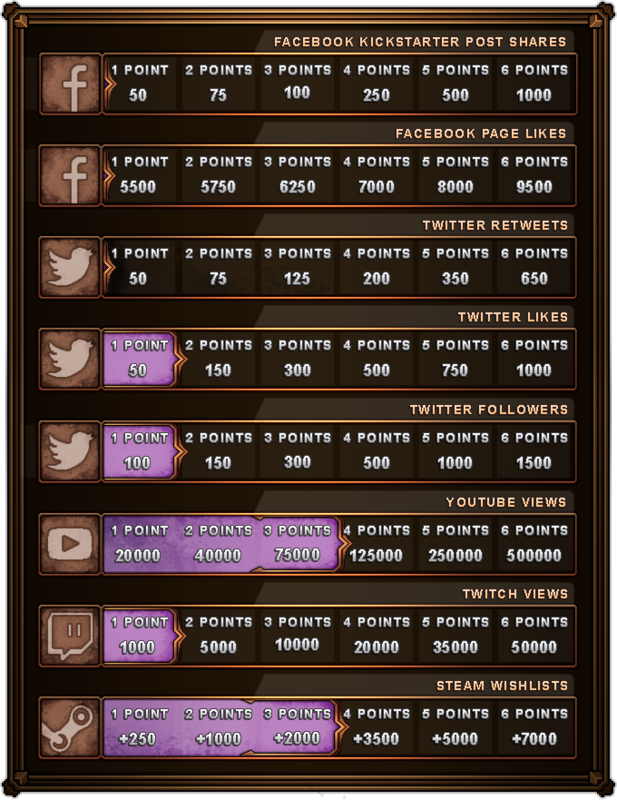 Thanks to your activities on Steam, Youtube, Twitch and Twitter, you’ve earned 15 points and unlocked the first social award! A special additional logo with the nicknames or real names of our Kickstarter backers! This logo will be prominently displayed in the main menu for everyone to see. Names on the logo will constantly change, so everyone will have their moment. Keep up the good work, guys! 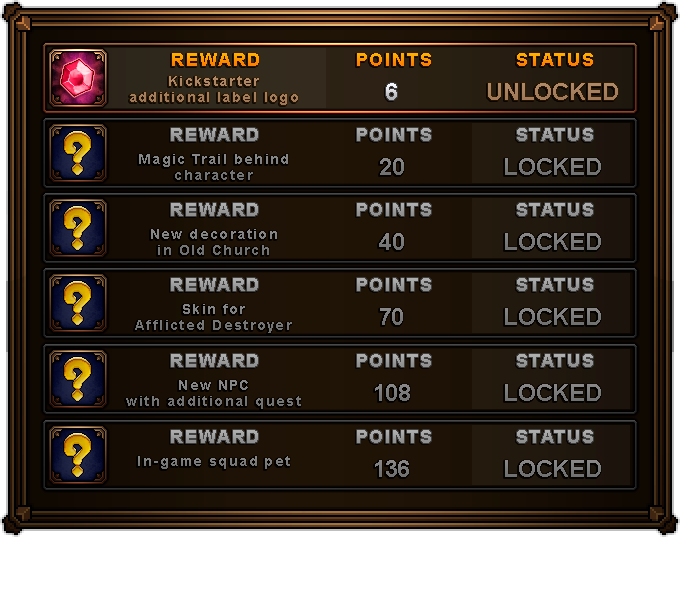 Continue to spread the word about Sin Slayers and we’ll be able to unlock even more cool in-game stuff! Sin Slayers: The First Sin is a free demo of Sin Slayers, an isometric RPG with roguelike elements, where your choices determine how challenging the fights and enemies will be. This version contains 2-3 hours of gameplay, all major game elements, first story act and one procedurally generated map, that you can clear multiple times. Create, equip and lead a team of heroes. Each unit will have its own abilities and weaknesses, so plan your combat strategy accordingly. You’ll journey through stinking primeval forests, boneyards riddled with crypts and the graves of fallen warriors, and other places even the bravest adventurer would fear to tread. Battles, traps, and bizarre enemies... Everything and everyone wishes to take your life, but don't succumb to despair. Between fights your party can take their rest at a fountain, or while on the road in an old church which leaves its doors open to the weary and wounded. Travel every path and byway of the Valley, obtain new weapons on the field of battle or by fulfilling quests, gather ingredients for magical elixirs and resources to craft armor and amulets. If a certain item is beyond your crafting ability, ask the blacksmith in the Old Church for help. The best gear will allow you to challenge the deadliest monsters. The souls of many heroes were cursed upon death, leaving them to wander a dark and uncharted world, an afterlife reserved for sinners. Is this the end, or..? Gather your team. Equip them with weapons, armor, and amulets. Level up your abilities as you move forward. The Sin Lords must be slain. Sin Slayers features a classic turn-based combat system in the tradition of the best JRPGs, giving you free rein to pit your tactical skills against the wretched inhabitants of the Valley of Fallen Sinners. Steel yourself. Enemies are everywhere and you will need to make difficult decisions and face dire peril to prevail. Depending on your choices, the sinfulness of your team will go up or down. If it's high — expect tougher enemies. Whatever might be buried there, is it wise to desecrate those graves? Every decision you make matters, and on the road to the next Sin Lord you will have many opportunities to choose poorly. Every crusade against a Sin Lord will be unique as every location is randomly generated. Think you know everything there is to know about a fetid swamp? We promise there are new lessons to learn, though they may not be to your liking! Legends tell of a place betwixt worlds, a region outside time and space called the Valley of Fallen Sinners. A dense, preternatural fog lays like stinking breath over black woods. What cursed hordes await? Vicious beasts, damned warriors, the undead, and worse chthonian horrors, all with an unslakable craving for new souls to perpetuate their own unnatural life. This region is for the most contemptible cowards, those who died because of their sins and the darkness weighing down their souls. At one time, they lived as brave heroes across a multitude of worlds, and bards composed ballads to their noble deeds. Until the day darkness flooded their hearts and killed them. Truth be told, no one has attempted this before.